The tibialis anterior has two origins, one being the lateral tibial condyle and the other being the upper lateral surface of the tibia, and inserts on the medial surface of the medial cuneiform and adjoining part of base of the first metatarsal of the foot allowing the toe to be pulled up and held in a locked position. It also allows for the ankle to be inverted giving the ankle horizontal movement allowing for some cushion if the ankle were to be rolled. 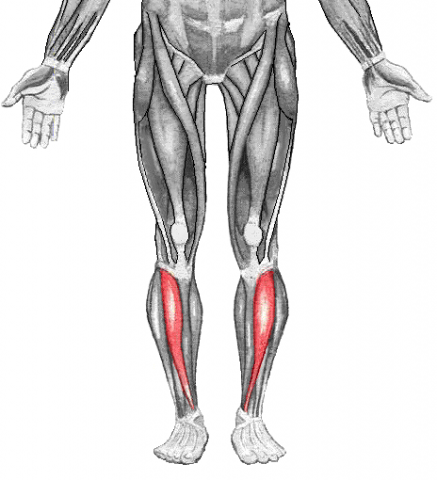 Antagonists are plantar-flexors of the posterior compartment such as soleus and gastrocnemius. Please check with your local government health agency if this muscle is an approved injection site for any movement disorder symptom. By visiting this site you understand, acknowledge and agree that no diagnosis or treatment of any kind will be based on any text, graphics, images, video, audio, information or other material contained on this site, or any site linked to or from this site.